Toxic employees harm your business and spread their behavior, poor attitude and outlook to others like an illness. While a difficult employee may test your patience and require extra coaching, a truly toxic employee will make your entire team suffer again and again. Toxic employees may exhibit a wide variety of behavior including bullying, slacking off, excessive complaining, resisting management, constant gossiping or refusal to work with others. The challenge with toxic employees is that they generally perform really well in delivery of services, yet manage to create drama with internal processes, policies and co-workers. Why do we allow toxic employees to stay? There is a term coined by John Maxwell I like to use: the ‘just enoughers.’ I love this term because it accurately reflects what many toxic employees do and how they behave. 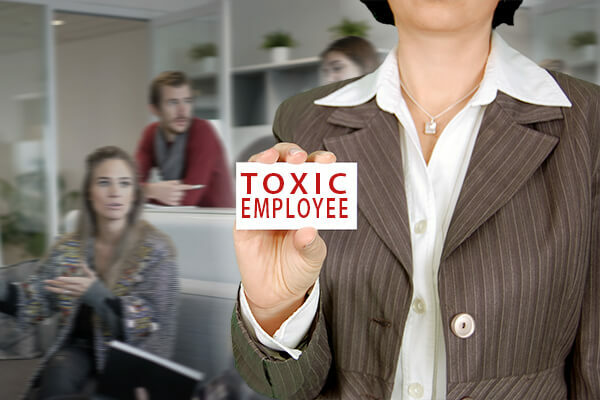 Toxic employees are generally eager to pick up additional assignments, but then request a modification to their job description and are curious as to how this will impact their pay. Often times, organizations go against conventional wisdom and grant these toxic employees a raise just to get them to do what is needed from a business perspective. The problem is that by granting them a raise or meeting other requests, the organization has now rewarded this ‘just enougher’ and encouraged them to continue in this behavior. Then the multiplier of this challenge is the toxic employee will share with co-workers, “Well, I got what I wanted.” Boom! Your organizational culture just changed and not for the better. Can a toxic employee be saved? It is an unfortunate reality that generally toxic employees have drama in their personal lives and find it very challenging to not bring that same drama to the work environment. Ask yourself if you have a ‘just enougher.’ Is the employee physically present but mentally absent? Does the employee leave at quitting time and does just what is expected and nothing more? OR, is the employee willing, cheerful, asking and mentally engaged? ‘Just enoughers’ and toxic employees are easy to spot. Every business has to make tough decisions at times to terminate or create a high-level accountability culture that demands cohesiveness and quality performance at the same time. Over the years I have seen organizations try to save toxic employees by coaching them to improved performance, but typically to no real improvement. Here’s two examples of the impact a toxic employee can have on a business. Hired an employee and thought this employee was a super star. Praised this employee, assigned additional responsibilities (likely too soon); employee asked for a raise. At the time, the organization was also eager to reward for the positive attitude. As time went on (two years), this employee became increasingly challenging when requested to perform additional or new duties and essentially only wanted to do certain things all the while asking for more money. The organization terminated the employee for various reasons. Within 30 days the organization was amazed at how smoothly things were running, even though they were operating with less staff. Why? The drama was gone! High-level employee was hired based on experience. This employee treated other employees with contempt and spoke down to them. Multiple employees complained of this manager’s behavior and how they treated others. The irony of this is that this employee was content doing nothing. They were not willing to step out of the box, not willing to make decisions, not willing to work hands-on with their team and generally difficult to get along with. The value this high-level employee brought was that this manager handled the day-to-day taxing issues with their team saving the owners those conversations. Then one day it happened, this employee turned in their resignation. That resignation was welcomed and many were happy. Organizations can become frozen in, “How do I handle this?” While these decisions are very difficult and certainly impact lives, the decision to move forward positively almost always works for the best of not only the organization but also the remaining staff. Still wondering where to start? Let Scott Human Resources create a customized approach to resolving the challenge of a toxic employee in your business. With an experience HR expert in your corner, you can feel confident in your actions as you work to preserve your team, ensure productivity and morale remain high and move your business forward. Call Scott Human Resources at 785-272-5410 or email Office@ScottHR.com today!